Click here to buy the book on Amazon.com. Young Elizabeth Balcombe, or Betsy to friends and family, found life on the remote island of St Helena intolerably dull. Most fourteen-year-olds would. Her father had been posted to that unforgiving station in the Atlantic and, being a family man, he took his family with him. Life was bleak in Balcombe's bungalow on the fringe of James Town. But then, in October 1815, the situation was transformed by the arrival of an unusual visitor. Napoleon Bonaparte, one-time master of Europe, now prisoner and exile, stepped ashore. The Balcombes, like all the islanders, were amazed. And even more so when Napoleon, taking a fancy to their bungalow (the Briars) moved in with them. Betsy, overcoming her surprise at sharing her home with an emperor, delighted in his company and the two became firm friends. Miss Betsy Balcombe made the most of her time with the world's most famous prisoner, keenly observing all around her, noting down conversations, recording moods. The result is a unique set of memoirs which records in astonishing detail an almost unbelievable story. That of how a precocious teenager and an emperor talked, argued, played, confided and teased their way through grim years of exile on the barren rock of St Helena. This attractive, illustrated edition brings this remarkable story back to life. "Considering the natural interest aroused by the story of the Emperor and the gamine (including many novels, children's books and even projected movies about the incident), readers interested in Napoleon's stay on St. Helena will want to own a copy of this book. 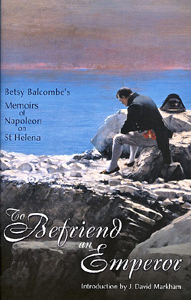 Ravenhall has given us an excellent new addition of Betsy Balcombe's charming (and sometimes surprisingly insightful) memoirs of her youthful friendship with the exiled Napoleon. French historian Marcel Dunan called these memoirs "one of the most pleasant sources to read" about Napoleon on St. Helena. Lord Roseberry has commented that "a strange mildew" rested on all the memoirs of St. Helena, but surely Betsy's recollections have little of the mildewed smell about them. Ravenhall has modernized the text, updating spelling and punctuation...Names left blank, in the nineteenth-century convention for protecting the identities of certain personages, have been identified where possible, and footnotes have been added. Otherwise the text of the original has been preserved. A useful introduction fleshing out the story told by Betsy, by Napoleonic expert J. David Markham, is also included. Numerous well-selected black and white illustrations have been added to the text.